Bold, daring, and yes, confessional, River Jordan’s collection of personal essays warns you going into it that you’re in for something unique. After all, what is the art of writing, if not a venue to compare notes on this business of life? Only a master can make this plain through the power of fifty delightful stories. This is a writer who asks the big questions for us; who owns a steady faith base yet thinks outside the box. Confessions of a Christian Mystic is devout and dauntless. It is sonorous, beautiful, soul-deep, and fearless. And it is sardonically funny in its skirt-lifted vulnerability. The chapter titled, “Sometimes Good Girls Get Naked” is a case in point. With a deft hold on sentiment without being overly sentimental, I won’t cheapen this important book by suggesting it’s a page-turner—it is better. Confessions of a Christian Mystic is something to savor. You’ll want to pause and ponder at the end of each chapter. I applaud every essay in this gorgeous gift of a book. River Jordan has woven vignettes of her personal narrative at such an engaging, introspective pitch that I defy every reader not to see themselves in its pages. The most salient aspect of this compelling story is author Michael Farris Smith’s economic, straight-forward writing. The Fighter is a tight, gritty story written in pitch-perfect Delta colloquialisms that hand the reader an attitude as a working frame of reference. From the get-go, the reader knows the main character, Jack Boucher, was dealt a raw deal. Unceremoniously abandoned by his parents while still in diapers, any reader with a beating heart is immediately invested in Jack’s unfortunate origins. When he is fostered by a single mother with her own cross to bear, the reader is lured page-by-turning-page, in the underbelly of a Deep South setting, hoping to see Jack take what little stability he has and scratch his way to better circumstances. That Jack Boucher grows up to be a fighter is a construct that operates in multiple layers, within a life built much by his own design. A through line of conscionable humanness staggers Jack onward, and there is much in this hubris suggested story to which the reader can relate. 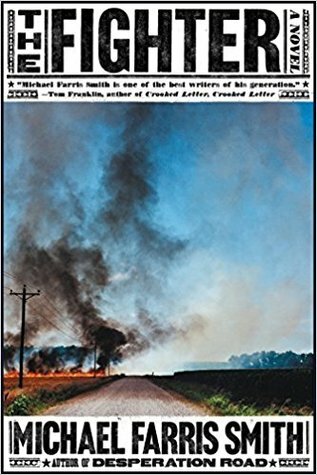 For all the reasons I love the author Ron Rash, I applaud Michael Farris Smith for deftly weaving a handful of character intensive threads into a deceivingly simple story. The Fighter is a book that packs a punch of resonance. Though its impact is immediate, its aftermath grows. Thank you to Sally Cronin of Smorgasbord!